This is the first music video from director Andrew Moore. The punning title is, of course, a plea to a divine figure rather than a children's author - but the Seuss characters (painted by guitarist David Mitchell) dominate this video, which is as crazed and chaotic as its soundtrack (and potentially seizure inducing at times?). David Saunders beseeches the camera, but respite comes only from a sequence filmed in a train carriage at Dunedin Railway Station. Is it possible for any New Zealander of a certain age to see that train shot and not think of the Crunchie commercial? “Unlike Siamese twins who are joined at the hip, we’re joined at the hip-hop…” This 1992 single was the opening track from MC OJ and Rhythm Slave’s What Can We Say? album, released on Murray Cammick’s Southside Records. 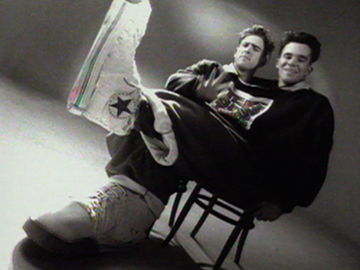 The duo rap that “we won’t stop until we get enough”, and the hyperactive black and white video captures the youthful energy of the then teenage pair. There’s Converse trainers, turntables, breakdancing, a sinuous silhouette, a ballerina, a hip hop wedding, a massive pillow fight — and some giant trousers that MC and OJ jointly inhabit. The second single from Wellington's country crossover kings is a classic tale of lost love and the girl that got away: propelled by Nik Brown's fiddle, with Barry Saunders out front singing it like a cowboy. 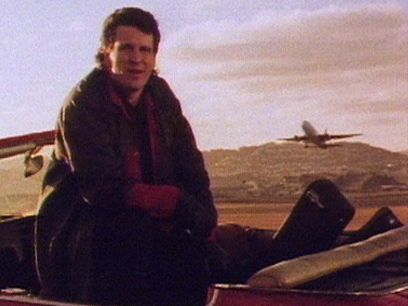 Director Waka Attewell's music video intersperses the band's performance with shots of Saunders in and around Wellington with a supporting cast of planes, trains and automobiles. The car is a cut-down Holden Belmont and there's a glimpse of the Cook Strait ferry (but the Warratahs' involvement with the Interislander is still a few years off). 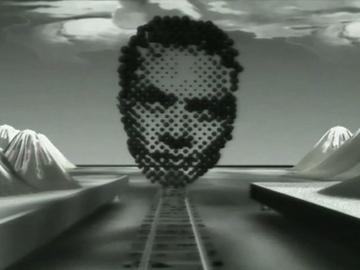 Moody, minimalistic and monochromatic, this animated clip matches the relentless forward motion of the song to images of a train moving across a landscape. Birds fly — as so do some of the lyrics — and the surroundings grow more Daliesque. Seed was one of three Dimmer videos directed by animator and sometime Dimmer drummer Gary Sullivan. Band founder Shayne Carter (Straitjacket Fits) complimented Sullivan's "straight on down the line" railway imagery for how ably it suited the song; it appeared on Dimmer's long-in-gestation debut album I Believe You Are a Star.